I did it again. For the 9th consecutive year, I moved to a new apartment. Sounds crazy doesn’t it? It is, but this move was a little bit different. My girlfriend and I got an apartment together. We woke at 6:15 in the morning to move out of both of our previous apartments and spent the entire day unpacking, sorting, organizing, arranging, and purging our stuff only to realize at 9 PM that we desperately needed to have dinner. 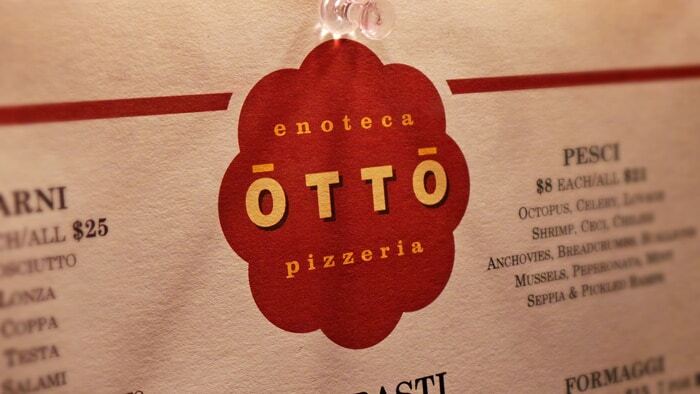 Lucky for us, Otto Enoteca, Mario Batali’s most casual eatery, was just a short stroll from our new place. I had heard really good things about all of the food, but particularly great things about their pizza and pasta offerings. This seemed like the perfect opportunity to give this date night spot a long overdue visit. 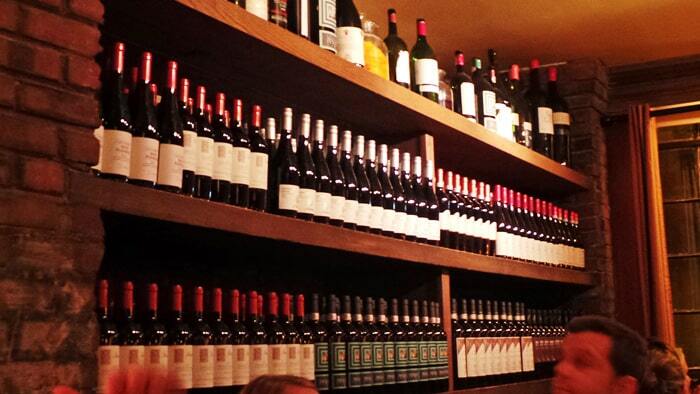 The restaurant has a large bar area near the front door with ample space further inside. As I was led to my seat, I learned that the restaurant was actually quite a lot larger than I originally imagined. There were many tables that could seat large parties, a good thing to keep in mind for future group gatherings. The decor was nicely executed to give the restaurant an upscale feel without seeming too stuffy or pretentious. I will caution though – the restaurant does get quite loud. Even at 10 PM, the audio levels were so loud that it was pretty difficult to hear each other speak despite the restaurant only being half full. Our raucous neighboring tables didn’t help matters either. At the table to my right, one guy had the most ridiculous laugh I’d ever heard. I tried to record a Vine to share with you all, but I don’t think my recording did it justice. You’ll just have to imagine a sound somewhere in between the cries of a howler monkey and a grotesque wheezing hyena. Fortunately, I was too hungry and drained from the day’s hard work to care. And because we were so exhausted from the long day’s work, a bit of caffeine felt necessary. Amy ordered a cappuccino at the beginning of the meal, which I’ve got to admit might have been the most complex, well-made, delicious cappuccino I’ve ever tasted. 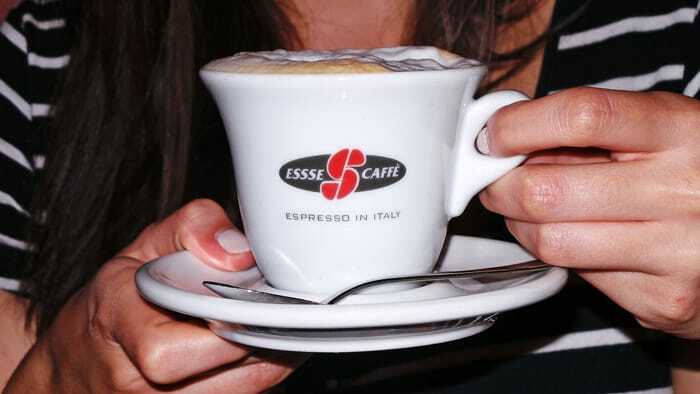 It came perfectly foamed with many interesting flavors to experience while sipping. After placing our order and waiting patiently for our food to arrive, we found ourselves entertained this time by our other embarrassing table neighbors. I honestly have no idea why this French tourist was layering napkins on his head or why he would think that it’s OK to do in public. Perhaps it’s a French custom. 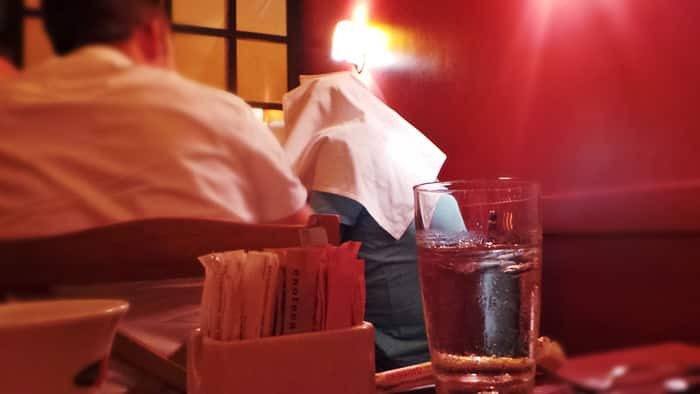 Perhaps he was just trying to muffle the obnoxiously voracious laughter from the opposing table. I guess we’ll never know. Our patience paid off. 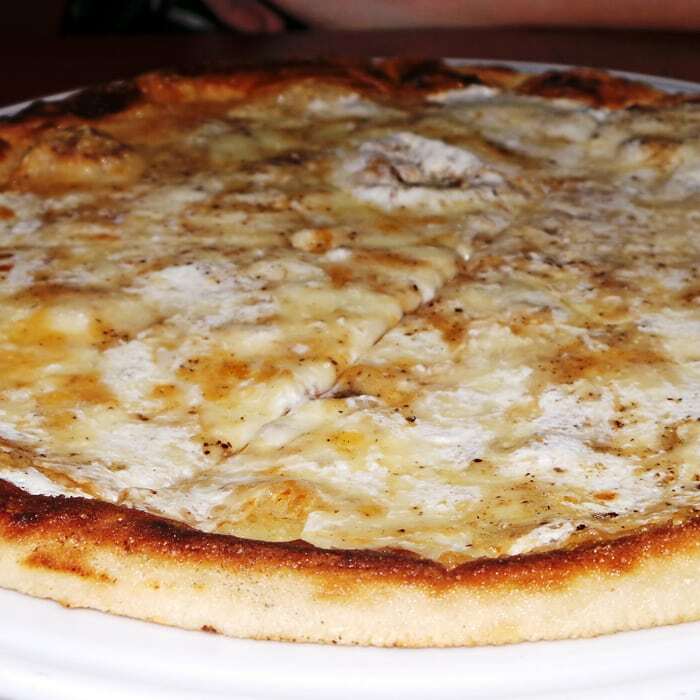 We ordered a Cacio e Pepe Pizza that came topped with mozzarella, cacio, pecorino, parmigiano, and a heavy sprinkle of black pepper. I could really taste every one of those ingredients, and together, they transformed into crispy, melty, oozy, cheesy, peppery bites that I couldn’t get enough of. The thin, crisp, flourless pizza crust served as the perfect vessel to transport the bursts of flavor into my mouth. I’m admittedly not a huge fan of the Neapolitan-style pizza joints all around New York. I often find myself wondering where all the cheese, sauce, and toppings are, but this pizza succeeded where others have failed. And it’s extremely satisfying. 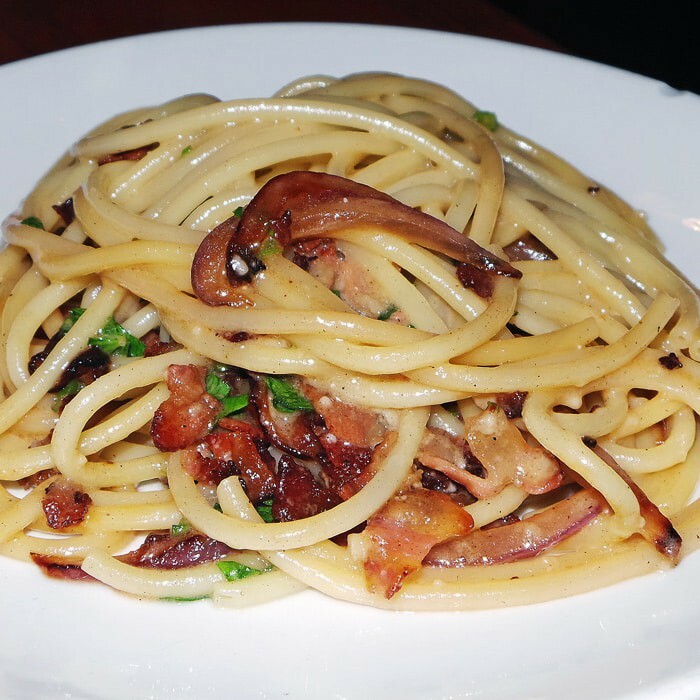 And not to be outdone by the pizza, the Bucatini all’ Gricia, which combined guanciale, onion, and black pepper with fresh bucatini pasta blew the pie out of the water. For reference, guanciale is basically bacon – on crack – except this cut of meat comes from the pig jowl, not belly. Trust me, it’s awesome. As for the noodles, I think I can comfortably say that bucatini is my favorite pasta shape. 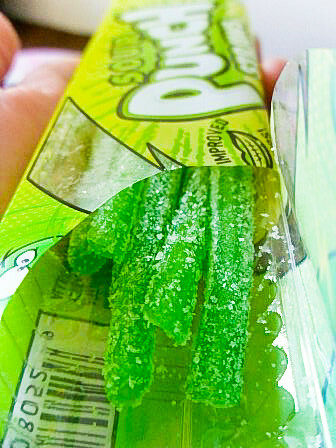 It’s essentially spaghetti with a hollow center like Sour Punch Straws. They had a really interesting, chewy texture that was only magnified by the amazing toppings. The whole pasta dish was extremely savory, garlicky, and boldly rich. Unsurprisingly, I enjoyed every last bite and licked the plate clean. I’ve also always enjoyed taking a nice walk after a filling dinner, so upon finishing this meal we did exactly that. We walked home by way of Washington Square Park nearby – a place where you never know what kind of weirdness you’ll come across. So, I’d recommend keeping your eyes and ears peeled while passing through. Just check out this wacky drumming-dance-party we came across. Somehow I managed to keep my clothes on. My verdict on Otto: Outstanding. This is what I’ve always wanted from an upscale pizza place, and it delivers where I feel most Neapolitan-style places do not. The ambiance is great, although it can get a little noisy. The food is expertly prepared and priced very reasonably, especially for a restaurant as date-worthy as this. 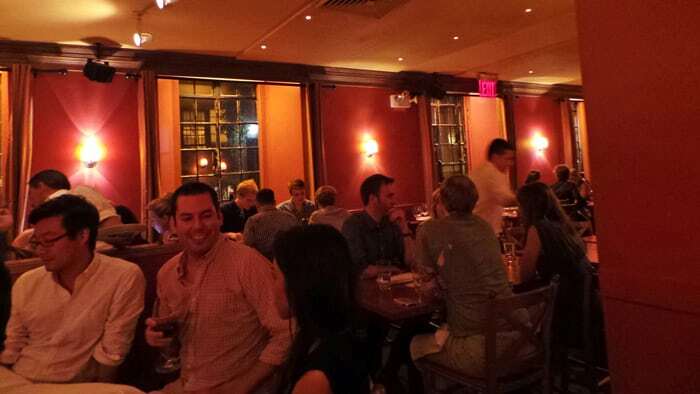 Got another great, Italian spot suitable for date night in NYC. Let me know in the comments below.